I’m just going to throw out a warning that for the next few weeks, this here blog is going to be very Christmassy. Christmas is a huge deal in our household; Eric and I are positively elfish in our exuberance for the holiday season. It took everything we had to hold off on listening to Christmas music until after Thanksgiving (I admit, we broke down a couple of times in the days before) and, well, in our neck of the woods our home has already been deemed a “winter wonderland,” which is exactly how we were addressed by a neighbor at our corner market last week. We certainly do not eff around with Christmas. 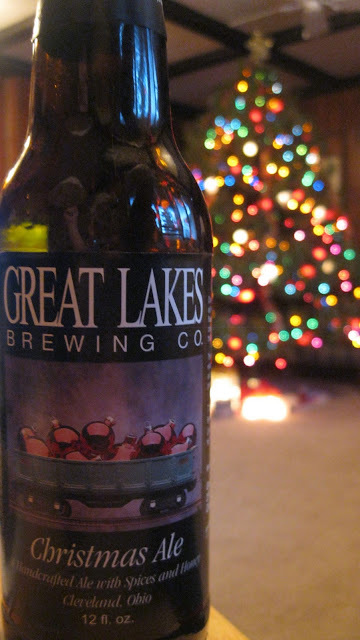 I hold a few Christmas traditions quite dear to my heart and rarely stray from them. I find it very difficult to adopt new traditions, mostly because the official Christmas season is only a month long and my Yuletide schedule gets pretty packed within that time (God help me if Rankin-Bass starts churning out new stop-motion holiday movies; I’d have to take off a couple days of work to squeeze those in). However, this year something has changed. This year, for the very first time in my 26 years on Earth, in my living room sits a real, live (well, it was alive a few days ago…) Christmas tree. 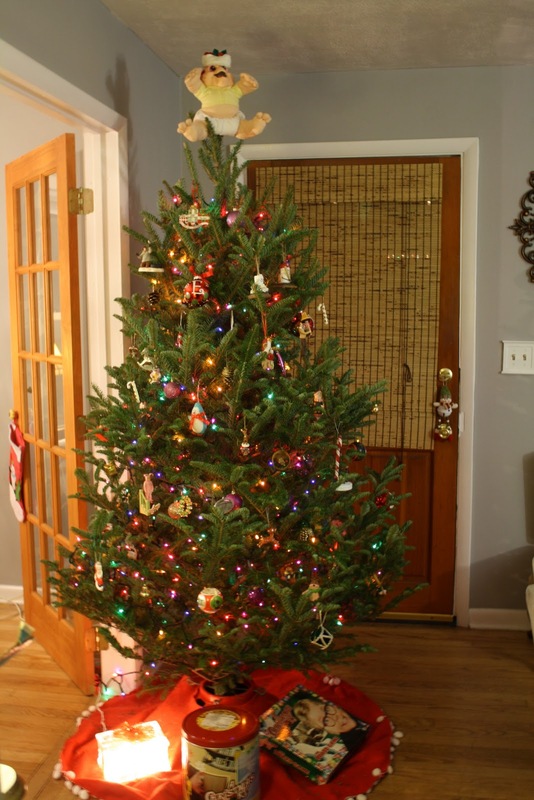 Yes, I know, I’m a self-proclaimed Christmas freak, yet I’ve never had the fresh scent of real pine wafting through my home during the holiday season. It’s just something I didn’t grow up with; my parents had a pretty bomb fake tree, all gigantic and full and easily carried up from the basement. And after I moved out, I was never allowed to have a real tree in the apartments I lived in. 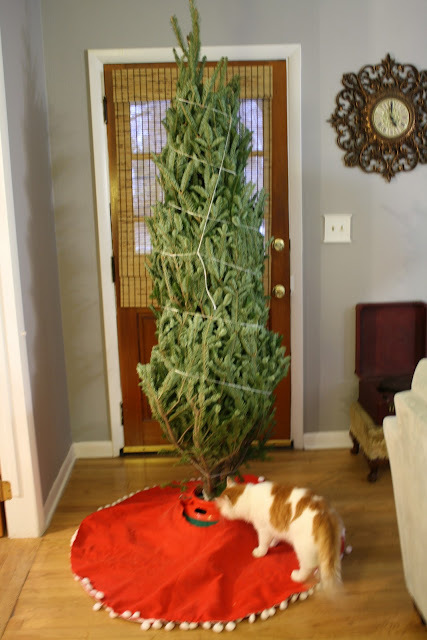 But this year, our very first year as homeowners, Eric put his foot down and insisted it’s time for me to experience Christmas with a real tree. I didn’t put up a fight, mainly because it seems like a very traditional practice and I like my holidays to be as Norman Rockwellian as possible. 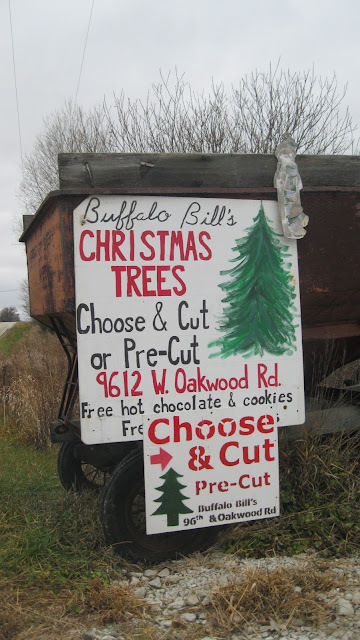 So, as we closely approached Milwaukee on our drive home from Ohio last weekend, we stopped at ol’ Buffalo Bill’s Choose & Cut tree farm to pick out or inaugural symbol of Yuletide joy. It was decidedly chillier in Wisconsin than when we left Ohio six hours earlier. 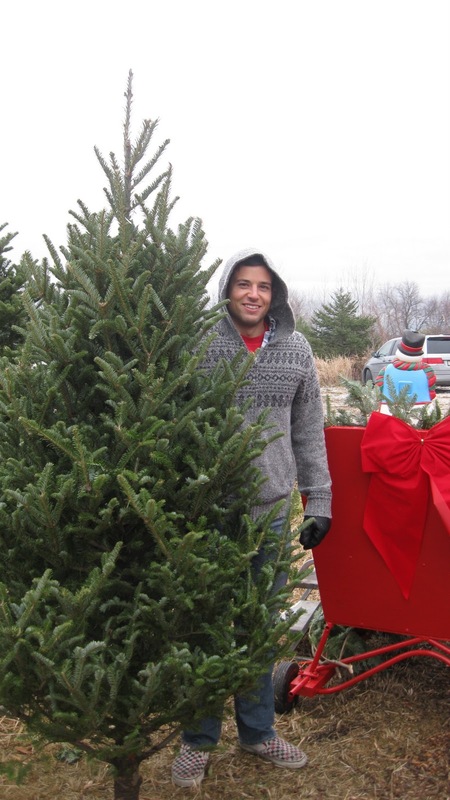 I was not dressed for the occasion, but soldiered on through the farm in search of the perfect tree. 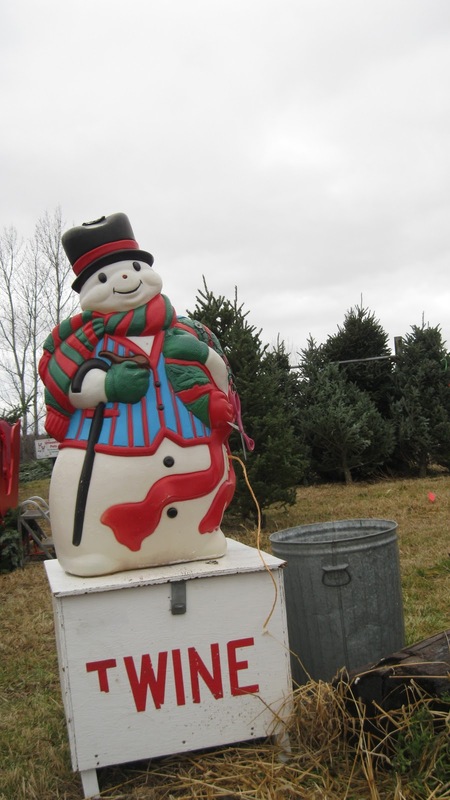 We walked back to section of the farm where all the trees were on sale – we quickly discovered why they were marked down, and turned around to check out the nice trees near the front of the farm. We grabbed some complimentary twine and affixed it to the top of our car. Meanwhile, I clung onto the twine inside the car with a strength I didn’t know I had the entire drive home. I was certain the tree would slip off the top of the car while braking for a stoplight. Once we got it home, Eric set it up in the tree stand and carefully unwound the twine that bound it. Of course, Mr. Pancakes had to get in on the action; Christmas is his favorite time of year, too, but mostly because it means he has a new, big toy that he can attempt to knock down every single day for a month… (luckily, this year he’s been pretty disinterested in the real tree – maybe the needles or the scent keep him away. I’m crossing my fingers this will last). After letting the branches settle (a new practice for me) I got to work on weaving the lights through all the branches. And, of course, we had to play a holiday classic on the record player as we prepared to decorate. Once the lights were strung, it was time to hang the ornaments! We both had some ornaments from our childhood to hang on our tree, as well as a few new ones. Since the Christmas right before I graduated college, I’ve received a new official Ohio University campus ornament every year. They’ve become one of my favorite gifts, as I love seeing which campus building was chosen for an ornament each year. This year, it was Chubb Hall, which houses the Office of the Bursar and class registration administration (I know, exciting stuff). 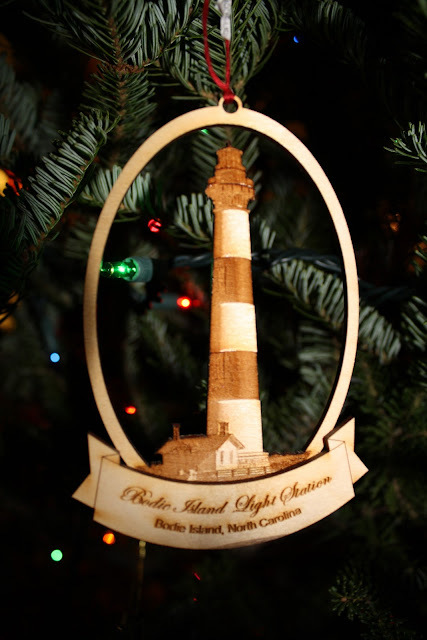 Before I left for Thanksgiving, my mom gave me my latest OU ornament, as well as a keepsake from our Outer Banks vacation this summer (remember when we visited the Bodie Lighthouse?). She also gave Eric two new “A Christmas Story” ornaments. I’ll get to his whole obsession with that movie at another time (seriously, no one – I mean NO ONE – can beat him in Christmas Story trivia... which is an actual board game that, of course, we own). He’s already got about six other Christmas Story ornaments, but I really loved these from the classic “leg lamp” and “Oh fuuuuddgggeee….” scenes. A few weeks ago, Eric and I also picked out a couple of new ornaments for ourselves. We saw these little S’mores guys at Home Depot and loved them. Making S’mores was a regular ritual while sitting by our backyard firepit this summer, so we thought it’d be cute to get S’mores characters that represented us. Eric chose a baseball player, and I chose a S’more with popcorn because they are seriously my two favorite snacks ever and I couldn’t believe someone actually manufactured an ornament combining the two. It was fate. And, naturally, Mr. Pancakes has his very own ornament, as well. Obviously he is thrilled with it. Even though we had a new tree, we had to continue a tradition we started a couple of years ago: topping the tree with something that is so very us. That’s right. 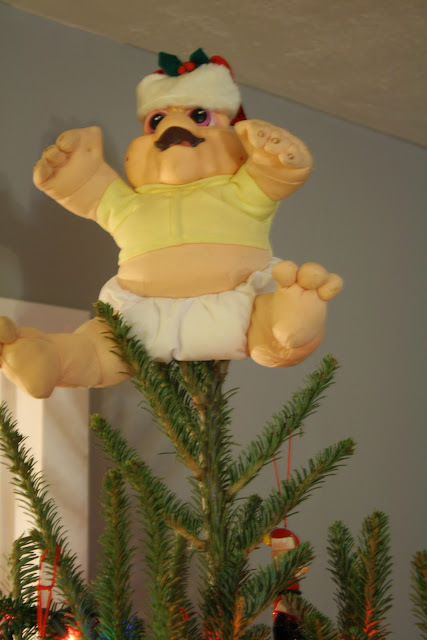 We won’t settle for any ho-hum star or angel or whathaveyou, the topper on our Christmas tree each year is none other than Baby Sinclair, from early-90s TV’s “The Dinosaurs.” (Adorned in a Mr. Pancakes-sized Santa hat that has never gone over too well with our fine feline friend). He’s the baby, gotta love him. So, there you have it. My first real Christmas tree. I have to admit I can’t really smell it that well; perhaps my nose is stuffed up because Eric says it smells great to him, but I feel left out! Either way, I will admit I like having a real tree in our living room. It’s authentic and beautiful and, most importantly, seems to keep Mr. Pancakes from ruining the holidays. What about you? Do you have a real tree or a fake one at home? 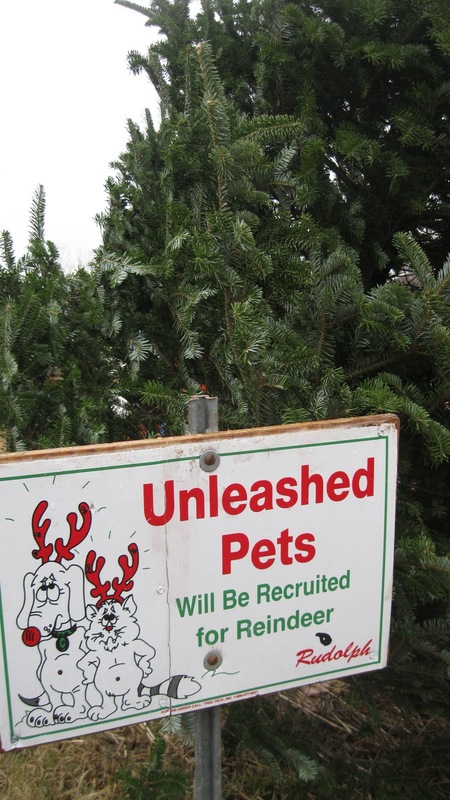 Are you adopting any new Christmas traditions this year? We’ve already had plenty of holiday cheer in our household, but before I get to that, I’ll share my happy holiday weekend with you. Eric and I spent Wednesday through Sunday morning in my hometown of Greenville, Ohio. Early Wednesday morning, we packed up our things (including Mr. Pancakes, who is the best little roadtripper ever!) and hit the road. I hadn’t been back home for more than six hours straight since Christmas! It was so great being home for a long stretch of time, and no matter how old I get, it’s always a great feeling to be back sleeping in my childhood bedroom (now without the wallpaper banner adorned with kittens and flower pots). Thanksgiving was pretty standard over at my grandma’s house – nearly 20 people were there, and I got to enjoy my favorite food: my grandma’s noodles. Mmmmm… so delicious. Forgive me for not taking any pictures of my meal; I was way too busy scarfing it down. Later that night, Eric and I went over to the local movie theater to see “The Muppets.” I hadn’t been to that theater probably since junior high school… it’s not exactly the most, eh…. elegant… of cinemas, but the tickets are $5 and it’s a mile from my parents’ house, so it did the trick. The movie was so adorable – one of those films where you just smile ear-to-ear from the opening shot through the closing credits. I used to watch reruns of “The Muppet Show” on Nickelodeon when I was a kid, so it brought back a lot of great memories from the original show! Plus, Jason Segel is just so dang likeable. I may or may not have come back to Wisconsin with plenty of each of the above beverages to hoard for a couple of months. We also took a stroll along Downtown Greenville, visiting all the little shops on the main street during Small Business Saturday. And we finished at the KitchenAid Experience: Greenville’s store devoted to KitchenAid appliances and cooking/baking products. 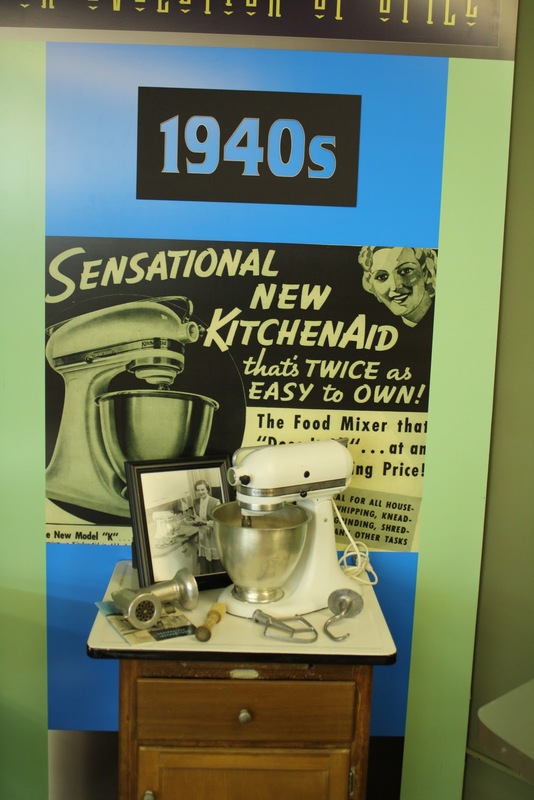 Greenville has its own stand-alone store because not only is there a KitchenAid factory there, but it’s also the only place where those famous KitchenAid stand mixers are produced! 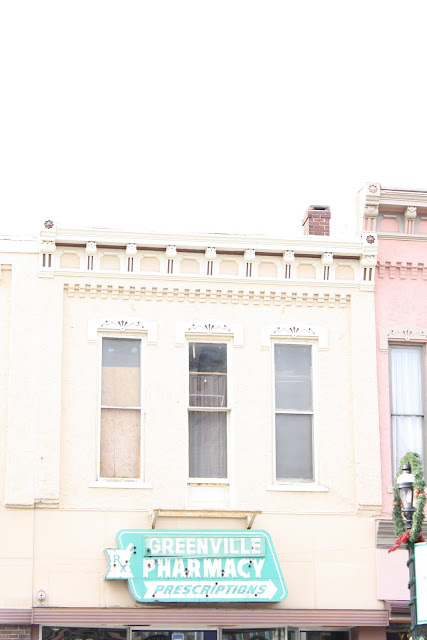 Aside from being the birthplace of Annie Oakley, it’s our little town’s claim to fame. 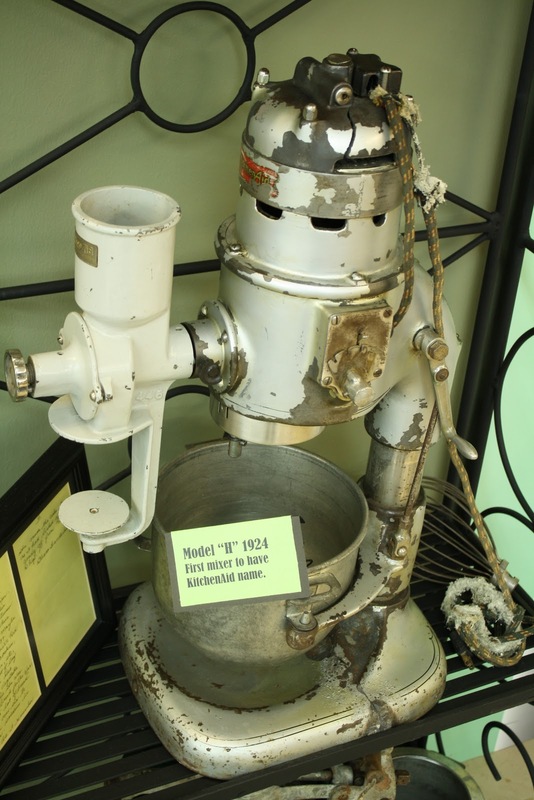 In the lower level of the store is a little KitchenAid mixer museum of sorts. They’ve got unique and antique mixers from the very beginning on display, including one used frequently by Julia Child herself! 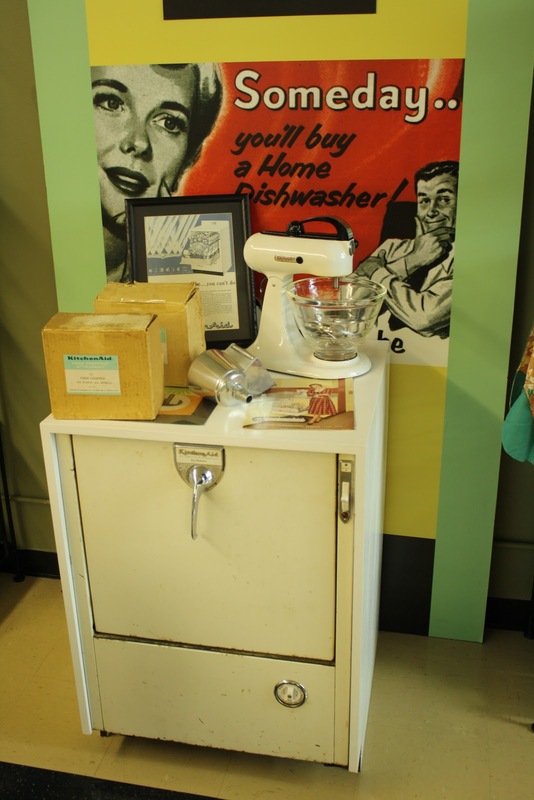 While I didn’t buy anything at the KitchenAid Store, I did find a few things to add to my Christmas list. On the last evening, we played old VHS tapes (I seriously forgot how annoying it is to have to rewind all the way to the beginning of the tape) of Christmases from the years 1988-1991. It was hilarious to watch them; especially in ’88, when I was way more interested in the tube of Chapstik I’d received than any of my other presents. Gifts also received by myself and my brother on Christmas morning those years? Nintendo, Game Boy, Etch-a-Sketch, My Little Pony, Polly Pocket, American Girl doll accessories, silk shirts, tons of Starting Lineup and Teenage Mutant Ninja Turtle action figures, Pocket Rocker mini cassettes, a boom box and a pair of red Air Jordans that apparently stretched out my brother’s belief in Santa for a couple more years. Man, the late ‘80s/early ‘90s were either totally rad or completely terrible. Either way, we were really fortunate to score some pretty sweet toys. While we watched the videos, I helped my mom trim their Christmas tree! I always love decorating the tree and pulling out ornaments from years past. 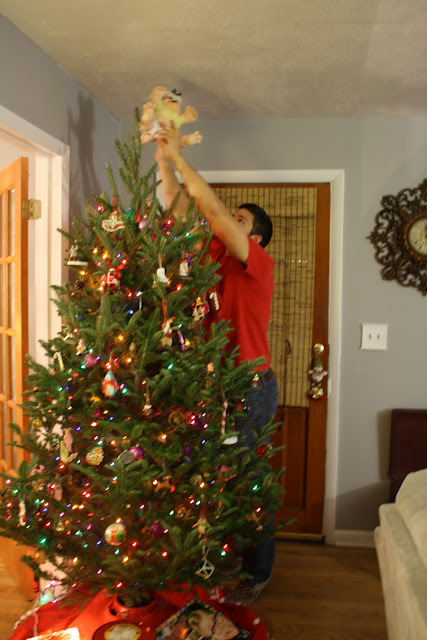 Through the years, my mom has built up a huge collection of ornaments, so it took a while to finish with the tree, but it was a lot of fun doing it – I hadn’t been home to help with their tree in years, so it was great to be able to partake in the tradition once again. 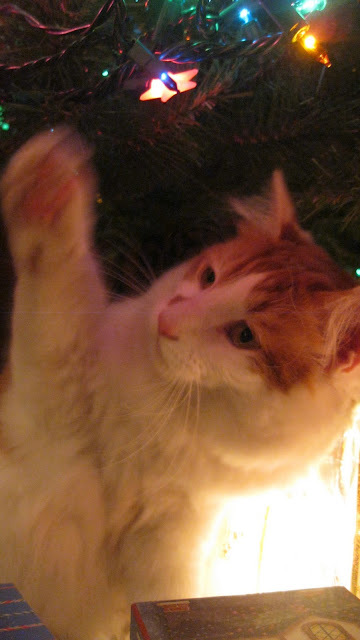 And someone else was pretty happy to have the tree up, as well. Though we were there for four days, trips back home never seem long enough. I get back so rarely that I feel like I need to squeeze so many things in! Thankfully, I’ll be headed back for our Christmas celebration in a month so I’ll get to do it all over again! How was your Thanksgiving? Do you have a special tradition that’s your favorite every year? Do you travel or are you able to stay home for the holidays? Just because it's a holiday weekend doesn't mean I haven't been pinning things! 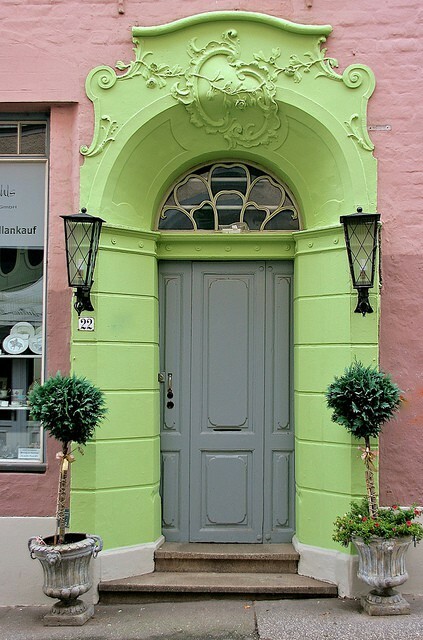 Here's what caught my eye on Pinterest this week. There's plenty more where these came from! Follow me on Pinterest to see everything I pin all week long!